Something funny is happening on a U Street corridor building. 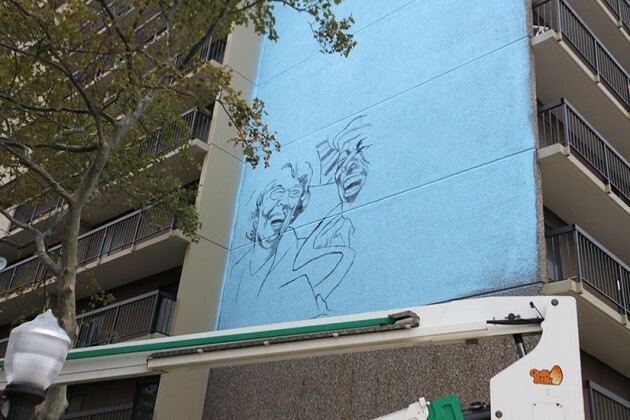 A mural with two people who appear to be laughing is taking shape on an exterior wall of the Paul Laurence Dunbar Apartments at 15th and U streets NW. 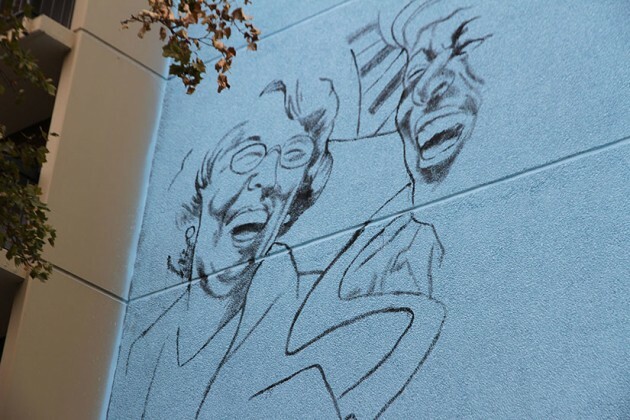 The six-story mural had outlines of a man, a woman and possibly a piano keyboard on a light blue background early this afternoon. The sketches take up less than a quarter of the space set aside for the artwork. 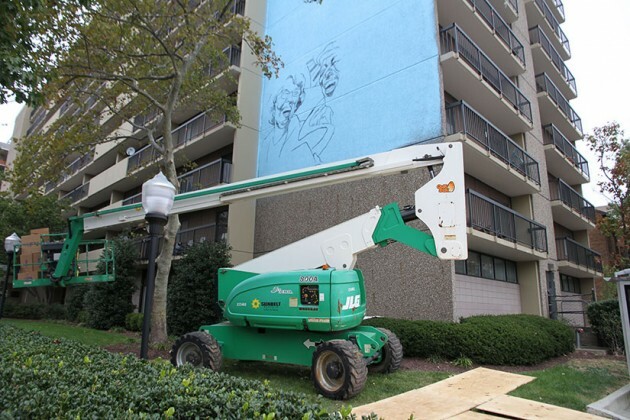 It isn’t clear yet what artist Aniekan Udofia plans to do next with the mural. He has stayed mum about his intentions for the project and wasn’t at the mural when Borderstan visited it today. 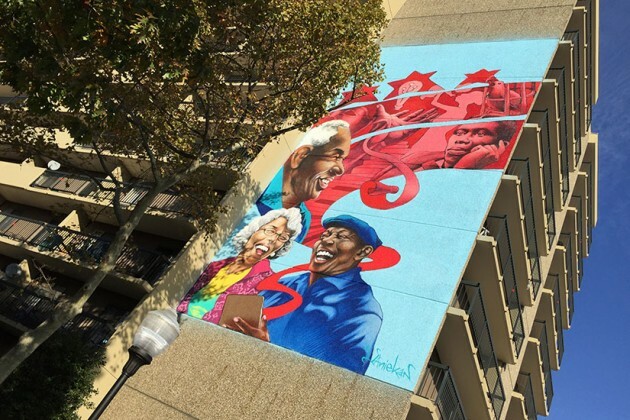 Udofia’s work appears in Shaw, Adams Morgan and other parts of the District. Last month, Udofia completed a mural on the side of Bohemian Caverns at 2001 11th St. NW. He is also the artist behind the now-controvesial painting of Bill Cosby on the U Street Ben’s Chili Bowl. With all the construction around Borderstan lately, it’s sometimes easy to forget that every house, parking lot and retail store had a previous life, if not several. DCmud has a great blog post recounting the history of the parking lot of the Paul Laurence Dunbar Apartments at 2001 15th Street NW. The buildings were formerly Campbell Heights Apartments (until recently), before that they were called the Portner Flats (a luxury apartment building) and before that the Dunbar Hotel. The Dunbar Hotel was the elite black hotel (when Washington was very much segregated) in the heydeys of U Street’s jazz scene and Duke Ellington, Sammy Davis Jr. and other performers were regular guests. The space will begin a new life as the Jair Lynch apartment project at 15th and V Streets NW after much redesign and consternation. Tom Hay reported back in July about the project. Jair Lynch Development Partners, headquartered at 1508 U Street, worked with the residents association of the Paul Laurence Dunbar Apartments to recapitalize and renovate the 171 unit building. The deal preserves its status as affordable housing for senior citizens under a covenant which will last for 30 years. Going up just north of the current senior citizen apartments is a 95-unit rental building by Jair Lynch; DCMud has a great rendering of the building. The east view of the Dunbar Apartments at 15th and U Streets NW. A partnership of non-profits is creating a community garden on the grounds of the Paul Laurence Dunbar Apartments at 15th and U Streets, NW. The effort is being coordinated by Living City DC 14th & U, the local program of the national Living City Block and DC Greenworks. Headquartered in Denver, Living City Block works with local groups to create sustainable and resource efficient cities — one block at a time. The Living City Block DC boundaries includes the blocks between 13th and 15th and U and V Streets. DC Greenworks will offer planning and installation guidance. The non-profits will receive assistance from One City Summer Youth Employment Program. Young adults from the program will help build and maintain the garden through the summer months. In addition to providing fresh produce to the senior residents of the Dunbar Apartments, the garden will facilitate interaction between residents of the Apartment and the surrounding neighborhood. An under-used shuffleboard court on the property will get new life as the community garden. The design of the garden includes raised beds, this method allows easier access for seniors to tend the garden. Project organizers are seeking assistance from the community on Saturday, June 30 at 10 am to install the garden. Location is the Dunbar Apartments, northeast corner of 15th and U Streets NW. Email [email protected] to volunteer. The Paul Laurence Dunbar Apartments recently joined with Jair Lynch Development Partners to refinance, renovate and ensure the apartments remain affordable housing for several decades. The apartment complex at 2001 15th Street had previously been know as Campbell Heights.